Slowpoke47 2 days, 13 hours ago. Dell Inspiron 519, running Windows 7 HP x64. Up to the end of 2018 I’ve done weekly backups using a Seagate 500GB external drive and the backup software that came with it. Now several years on, for some reason that program stopped functioning, could not resuscitate. 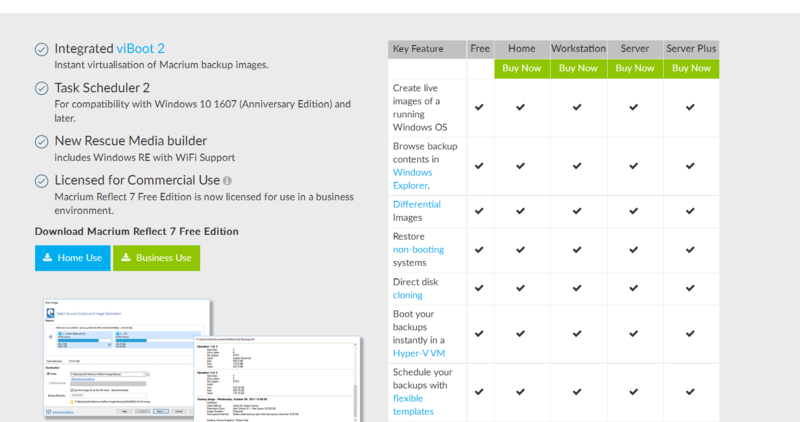 Started using Veeam Free backup software last January, on that same ext. drive, and weekly backups resumed until this week, when Veeam could no longer find the target drive, even after several attempts. Reloaded the software, no joy. i actually have not particularly liked that program anyway- it proved difficult to manipulate for this non-tech user. I’m ready to try something else, preferably that can be programmed to delete the older backups when space is needed for the new files. Our backups are by no means sizeable, but nevertheless, important! What are you using? Do you like it? “Enquiring” mind(s) want to know! I’m using SyncBack Free to create backups to external drives. It’s quite a powerful program, but probably it’s not very user friendly.. I would also get another back-up drive as it sounds like it is failing, use CrystalDiskInfo, external SSD’s are cheaper now compared to years ago; do you have an SSD in your Dell as the main drive? Can you see and access the Seagate drive in file explorer (or from my computer)? If so, does the drive letter match what the backup software is looking for? You were using Veeam Agent for Microsoft FREE? Macrium Reflect will delete old backups when free space is low. As far as misbehaving… no idea if this relates to any of these other moves, but yesterday the weekly backup failed several times, “target drive not available.” This is the same program I’ve been using since first of the year or so (Veeam). Start>Computer shows the same 500GB Seagate external drive that I’ve used all along as being “.99GB>” What’s up with that? No backup program is going to work, unless the backup hard drive (HDD) is functioning, and set up properly. We need more information on what the status of your backup HDD is. But, I don’t know if it will automatically delete the old backups–because it only backs up *new, or changed files*, and leaves all other backed up files as is. I’ve never filled my hard drive with multiple backups–just the ongoing addition of new and changed files–so the backup doesn’t grow that much–but, everything I have programed the program to backup–is backed up! And, it’s in the original file type as it was originally saved on your HDD–so a text document can be loaded from the backup location, pictures or audio files–same thing. There’s no *proprietary* backup file-type that is only readable by the backup program. All files are in their *native* form and viewable in the Windows File Explorer, or any other file management program of your choice. Karen’s Replicator will work many ways depending on how you set it up. You can choose to make discrete separate backups each time, or like I set mine up to mirror my current data. I think the topic I started under Tools is pretty thorough (with pictures for those who don’t read well 🙂 ). It does pretty much what copy/paste does, but handles the errors for files that can’t be copied. You can create exclusions for the errors if you know you don’t need the files involved. It does not do images, preserve programs or OS operability, so it is not for system backup. I think the topic I started under Tools is pretty thorough (with pictures for those who don’t read well 🙂 ). Been using the free Cobian Backup for years. Not an imaging program but a file backup. Very configurable and works great. Like NightOwl mentioned, you’ve got to see what’s wrong with the drive first to make Veeam not recognize it. Something changed from when it worked to now, and that’s something that you should definitely get straightened out. If the external drive is failing, it is no longer suitable as a backup device. I just bought another external myself… 4GB WD, bus powered USB3, for $99. Storage is so cheap now! Kind of ironic timing… I just discovered Veeam (which also has a Linux version) and posted about it yesterday, and here it comes up again. I’ve never seen the Windows version, but so far the Linux version (which uses a character UI, but is wizard-driven unless you want to use the command line) seems to be what I was looking for. For Windows, if you still want a new program after you fix the hard drive issue, I would suggest Aomei Backupper. It’s powerful and fast, but has a simpler UI than Macrium Reflect, my other go-to Windows backup program. I’ve used it for many backups and quite a few restore operations as well, and it has been reliable and quick. It backs up and restores Linux volumes as well as Windows volumes. The only reservation I have with Backupper is that my dual-boot setup had (wait for it…) the bootloader messed up a couple of times when I restored from backup, and it wouldn’t boot after the restore. It seems that Backupper tries to install its own bootloader fix of sorts rather than simply restoring what is in the backup image, and it ended up booting to a GRUB> prompt instead of the menu for Windows or Linux. Switching the Windows UEFI entry in the onboard firmware setup to the first priority resulted in a successful Windows boot, but getting Linux and the boot menu working required some intervention on my part. It’s a super simple fix that takes me only a minute or two to perform, but if you consider a boot failure to be more “catastrophic” than “annoyance,” it’s something to be aware of. Hopefully, you’ll never need the backup anyway! This was with UEFI setups, so I am not sure if this would also be an issue with BIOS systems like your PC we were talking about before that you took the Vista drive out of. If this possibility bothers anyone who runs a dual-boot setup, I suggest something else, but for Windows-only setups, it’s a decent program. In my case, the benefit of having encrypted backup sets in the free version was worth the annoyance of having to fix Linux in the infrequent occasion of having to restore from backup. The free version of Backupper used to have encryption and incremental backup options, both things that Reflect’s free edition lacks, but the Aomei devs have removed encryption from the free version as of about v4.5 or so. The full version would be well worth the money, and I may have purchased it if I hadn’t decided to move to Linux as my main OS. Purposefully left all that out (so as not to complicate the issue) because what I am asking here is basically what others are using for backup programs. On this thread, could have left out the history as well. But, to be clear, the Seagate software went awol long before any of the shutdown problems you reference began. I guess I could have tried reloading the program at that time, but I did not. I haven’t liked the Veeam since day 1, so I didn’t need much of an excuse to dump it. But, I did try a “reset” by formatting that external drive and reinstalling the Veeam software. This didn’t fix anything. I was pointed in my “no shutdown” thread toward Macrium, where I signed up for the “trial” version when I should have signed up for the “free” version. But with the help on that thread, I learned how to take a system image with that program. I did think to check whether Macrium included a backup function, both functions from the same program might be tidier. Just wanted to hear from others first. Yes, I started from there to format the drive. And I did make sure the drive letters matched. Veeam actually prepared the drive to receive backups but then, when backup time came around, same drive in the same port, Veeam could not find it despite several attempts. Also checked Disk Management, that drive had a small volume established by Veeam using FAT32 format. The rest of the drive was NTSF. Note that Veeam started with a clear slate. I have since reformatted that disk to prep for the next move. I don’t think this disk is failing at this point, I think there were software errors. Anyway, as stated, I wasn’t that crazy about Veeam. I used Acronis True Image on my Vista system for years. Then one day I decided to try a solid-state drive (SSD) to speed the PC’s operations. The image transfer went fine, but after booting into the SSD, the next time I went to do a backup image with Acronis, the software refused to work, saying something about having to purchase it. I suspect that it noticed it was a different drive and some kind of copy protection set in. So I went looking for a different backup program and discovered Macrium Reflect. Not only does it work, but the first time I ran it I noticed that it completed the full system image in less than half the time that Acronis did. what I am asking here is basically what others are using for backup programs. I use/used Acronis, Aomei and Macrium. I prefer Aomei free for straight backup tasks, Macrium paid for complex management. Decided on Macrium Reflect Free, which I will use for system images and weekly backups. Currently installed, first backup yesterday was drama-free, now set for my usual Monday morning backups. My thanks to all who posted to this thread. When we were talking about how to create image files with Macrium Reflect in another Topic, you were using the *30 Day Trial* version of the paid version. Have you switched over from the trial version to the free version? Macruim Reflect Feature Comparison of the different versions. The first screen shot just shows the column titles of the different versions. And the second screen shot is the list of features further down on the webpage. Being able to backup *files and folders* is a feature listed as not available in the *Free* version. Unless this is an old feature comparison, and Macrium has changed what’s available in the *Free* version–if you’re using the *Trial* version, the ability to do the *files and folders* backup may disappear at the end of the 30 day trial. Just an FYI. Let us know what the status of the Macrium Reflect version is so others will know if that feature exists in the *Free* version now. Maybe others can answer that question as well. That was one reason I chose AOMEI Free over Macrium Free, because I wanted file and folder backup where I could access the data without need of the program being installed. AOMEI allowed “file copy” (they call it “Sync”) so I could read the files from Windows/MacOS without an installation. I looked at EaseUS TODO too, and the free version doesn’t allow file/folder backup. Let us know what the status of the Macrium Reflect version is so others will know if that feature exists in the *Free* version now. Yes, I switched yesterday. The 30-day trial had just a few more days to run, and it seemed a good idea to get the backups established to where revisiting the program would not be necessary. I did see that chart, and going thru the setup steps, as far as I can see, the Free version does full backups only. Yesterday’s took about 27 minutes. The Veeam that I was using allowed for a schedule including similar full backups with several “incremental” backups in between, adding to the most recent full backup only those files that had been changed. But, as stated, the UI was somewhat opaque to me, and in any case, ultimately could not find the target drive, which Macrium did with no issues. I didn’t look at the cost of the paid Home version of Macrium because, with the relatively smallish size of a full backup of our current Win7 files, there’s no downside to going that route. When I eventually get set up with dual booting Mint, I may revisit all that. I may yet revisit the backup issue. But for now, what with the mind-numbing intensity of my recent bootup and shutdown problems, I need a respite from being “under the hood”. I did see that chart, and going thru the setup steps, as far as I can see, the Free version does full backups only. “Cloning– the same as imaging but instead of storing data to a file, it replicates volume contents and disk structures to an alternate device.” Thereby creating an exact functional copy. I see from your answer that I worded my question wrong! I was not actually asking what Macrium says in their User Guide. I was really trying to get at what you interpret the Macrium Reflect instructions to mean in terms of what type of backups you plan on doing. This statement is *ambiguous* for me to follow as to what you are trying to say. The bold part could mean either *you plan on using the Macrium software to create system images on a weekly basis*, or *you plan on using the Macrium software to create a single system image, and some other form of weekly backups that are other than images*. 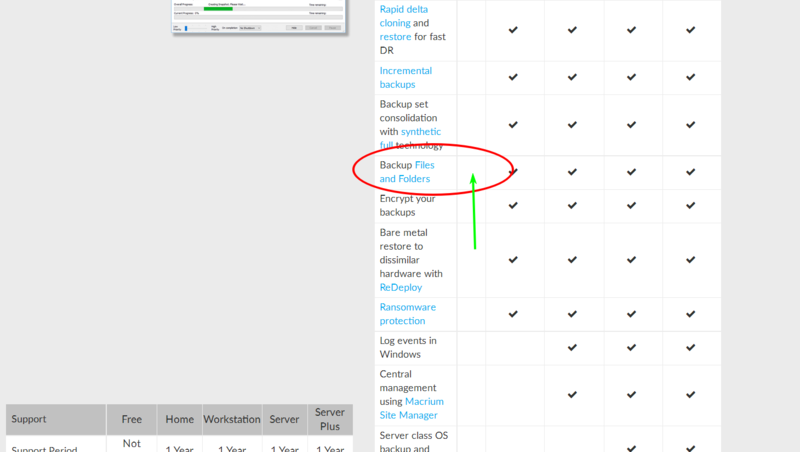 The underlined section–the *first backup yesterday*–is that a *full backup image*? And is the *usual Monday morning backups* another *full backup image* to be taken every Monday going forward? Or, are you trying to say something different than that? I was really trying to get at what you interpret the Macrium Reflect instructions to mean in terms of what type of backups you plan on doing. As far as I can see, in the UI as well as the user manual, the Free version offers only “Full” backups, which include everything- OS and all. Just completed the first scheduled backup- judging by the 25 min. duration and the size of the file on the ext. drive, this backup is the same as the initial one last week- everything on the HDD. I’ll be looking at other backup programs mentioned here earlier, as I would prefer that the weekly backups were not all of this “Full” variety. But I need to catch up on my non-computer “to-do” list that I set aside over the last month or so while dealing with these computer problems. At least, I have a backup plan in operation for now. Okay–looks like you have a handle on what’s happening–full image backups–is that on an automated schedule–set it and forget it? Or are you doing a *manual* image backup every Monday? Just to briefly address a *gap* in your backup plan–so, you create the *full image backup* today (Monday), and now wait until next Monday to do your next *full image backup*–you have a week where no backups are occurring. Any document files, photos, or other data files that are important that are created after today’s full image backup are not backed up until next Monday. If any file is lost or damaged for some unexpected reason during the week, you will not have a *backup* available. Your backup started today, and any new files are not backed up until next Monday. So, above, when you see someone refer to *file and folder* backups–that is *not* imaging backups–it’s exactly what it says–*files and folders*–usually backed up to a separate hard drive (HDD) from your system HDD so the files are not stored on the *same* HDD, and protected from a drive failure. It does not include the entire drive, nor the OS files that could be restored if you current HDD failed. Many times these backups are run daily–either once per day, or even several times per say depending on how much information changes on your system in a given time period. To have the *files and folders* backup option using the Macrium Reflect software, you would have to use the *paid version* (by the way, that costs $69.95). But, there were equally *free* versions mentioned above. But, there is a way to have daily backups (or more frequently–or less–whatever meets your backup needs, and how much time you can tolerate not having backups) using the imaging program, including Macrium Reflect Free. You could create *Differential* backups. That is where the imaging program already has the *full image backup* created, and then as often as you schedule the program to run (or done manually), the imaging software will scan the whole HDD, and any file that has changed, or any new file that it finds, will be brought into a new backup file–a *differential image file*. Now the previous *full image file* plus the *differential image file* become an *image set*–so all the files as they were on the day of the initial full image file, and all the new and changed files on the differential image file. A *differential image file* should be created in just a few minutes at most if the changes are few–and longer if there are lots of changes. So, *files and folders* backups, and *differential image* backups accomplish pretty much the same thing, just in a different fashion. But they can fill in that gap between *weekly* full image backups. Macrium for imaging O/S and Robocopy (experiment first!) for User Files. My routine. Bear in mind this is for my business machine. Acronis – image backups of OS run manually from boot usb drive every few months or before/after any major change. Thanks to all, unable to review these recent posts today, back in a few days. I expect to be making some changes to my backup procedures. I use either Macrium Reflect or Easeus Todo Backup. Mostly using the latter more than the former. I switched to the Free version a couple of months ago when my old dual backup drives became full, so bought a new WD “Element” 1TB and used Macrium with it. 1. I knew a Graphics Artist with a 5-disk RAID array (I’ll never lose any data!”) lose it all with one MOBO/Power Supply blow-out. It took all 5 RAID disks with it! He had to pay a data recovery outfit $$$$$$$ to remount the platters on to new controllers and then reconstruct the damage. He took to stronger drink. 2. Same thing happened to a friend who kept his backup drive plugged in all the time: His MOBO went nuts and fried both drives the same way. Macrium Reflect, and it’s ability to make images of the whole disk, or just the partition/s necessary to restore Windows is great IMHO. I do both, once a week. Runs like chain lightning on USB 3.0 compared to my old SATA–1 laptop drive-to-SATA-1 backup drive lash-up, and the WD Element drive only requires ONE USB port for power, as my old WD backups need TWO and a Y-cable (700 mils). OK, the proprietary WD connector cable from eSATA to the Element drive is a no-no, but I’m on a fixed income, and I got the Element very inexpensively. R/W is along 600-800 Mbs per second (depending on file type), and I can do it from inside Windows; I am flouting the traditional wisdom of my old Guru who said (jumping up and down) “You can’t back up Windows from inside Windows! !” (with great heat, he said this!) But trial restores seem to bear out that it can be done. Macrium also makes a Rescue Disk for worst case scenarios. I only use TeraByte’s IFD (Image for DOS) on my XP graphics workstation now. I know, “If it’s British, it leaks,”, but I have yet to see any puddles under the PC…good product, so far. I learned of it here! Your old guru was wrong, but probably hadn’t heard of Volume Snapshot Service, introduced in XP. Prior to that backup from within Windows was tricky. Anyway, thanks for the light! BTW, anyone have any humerous dubs for that NTFS acronym, like “Never Twice (same) File System”? Currently scheduled for Mondays. But the ext. drive is connected only when backing up. Understood, of course. This computer is 90% personal, 10% business. My past habit has been to do an unscheduled backup whenever critical files were adeded or changed. But, there is a way to have daily backups (or more frequently–or less–whatever meets your backup needs, and how much time you can tolerate not having backups) using the imaging program, including Macrium Reflect Free. You could create *Differential* backups. Macrium Free allows full backups only. I did attempt to schedule Differential backups. Before I make another change in backup programs, I’m going to look at all the alternatives mentioned in this thread- this is why I originally asked the question. In the meantime, At least I’m saving my data. Thanks to all for the suggestions! One thing I’d like to throw out is the need for offsite backups. I used to store my offsite backup in a safe deposit box at the bank. After a major hurricane hit our area and damaged my home/office I realized that even if the bank wasn’t destroyed it might not open for days, weeks, or months. That’s when I instituted online backups. Figure worse case scenario I can buy a machine, download needed files and programs and get back to work in a few hours at a hotel or whatever. As far as I can see, Macrium Reflect free does allow differential backups, what it doesn’t allow in free is incremental ones. Personally, I only use full backups, so I haven’t actually tried to set one up, but it stopped me trying to set up an incremental one without going to a trial of a paid version. Yes, @access-mdb is correct. I use the free version of Macrium Reflect and regularly do differential image backups. As @access-mdb indicated, what the free version doesn’t offer is incrementals. The free version also doesn’t have file-and-folder backups, as @nightowl pointed out. I like the idea of using a copy-and-paste type of backup software for file-and-folder backups, so I plan to look at Karen’s Replicator as recommended by @pkcano and others here. One thing I’d like to throw out is the need for offsite backups. Interesting comment. I’m not going to try and anticipate every possible doomsday scenario. While my corner of the world (R.I.) has had hurricanes, and we can operate essential home utilities in the event of a power failure, we can get along fine without access to the web. Our own data backups are stored on site and not committed to the cloud. As far as I can see, Macrium Reflect free does allow differential backups, what it doesn’t allow in free is incremental ones. Thanks for that. When I revisit backup options, I’ll take another look at it, must have misinterpreted. On a standalone system, I fully agree with that approach to your routine. Which is why I do not schedule triggers for backups that may occur when I have not yet connected the target backup drive. “Currently scheduled for Mondays.” Is it possible, that the failed differential backup error messages that have caused you difficulties in the past, may be explained by backup attempts that fail to find the target drive? The Macrium Free would not permit incremental backups. I plan to revisit the setup to see if I can schedule differential backups. There were no error messages involved. I did attempt to schedule Differential backups. Did you actually go through the process (the steps) to setup a *Differential* backup, but when you hit the *backup now* button, it did not *work*? Or, were the directions for setting up the *Differential* backup too confusing, and you simply abandoned the process? I plan to revisit the setup to see if I can schedule differential backups. There were no error messages involved. It sounds like you probably *abandoned the process*, if there were no *error messages*. … I do not schedule triggers for backups that may occur when I have not yet connected the target backup drive. What @ anonymous in Reply # 346393 is saying is that s(he) is doing *manual* full backups and/or differential backups, rather than *automated scheduled* backups, because the external hard drive (HDD) may not be hooked up yet when the scheduled event happens–which will end in a *failed* attempt to do the backup(s). If you are going to attempt to do daily *differential* backups, making sure your external HDD is hooked up every day at the appointed time may be a burden to remember to do. If you are going to attempt to do daily *differential* backups, making sure your external HDD is hooked up every day at the appointed time may be a burden to remember to do. I’ll be revisiting this once my shutdown issue (in another thread) is resolved. It’s likely I’ll stay with Macrium and reconfigure my backup schedule. Reconfigured Macrium Reflect to include differential as well as full backups. First scheduled differential backup went as expected today. I’m going to stay with this program. Thanks to all who posted to this thread.